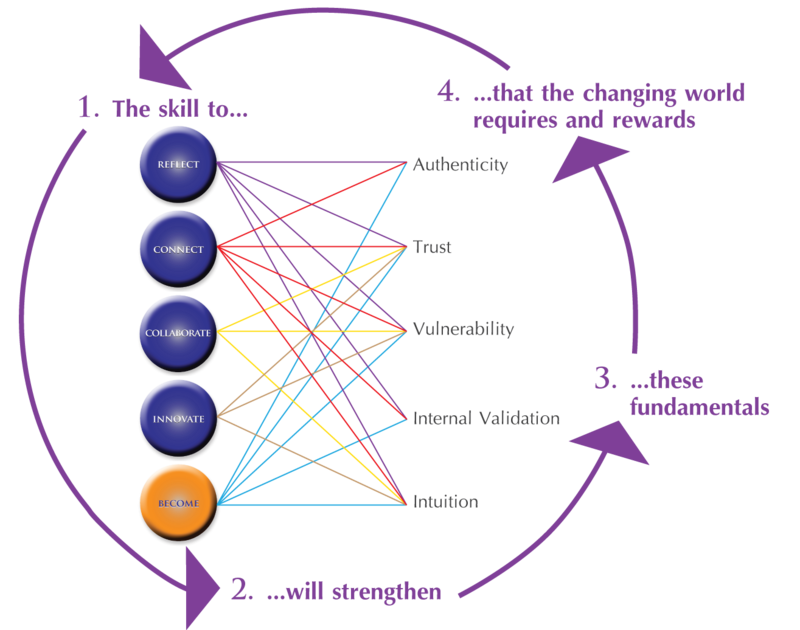 The ‘embers’ model facilitates what the changing world is rewarding – authenticity, trust, vulnerability, internal validation and intuition. By doing so, it is weaving a vast, interconnected body of support for the way ahead. How is your business demonstrating evidence of being a part of the changing future? What is internal validation in relation to the corporate world? Validation is a ‘stamp of approval’, often seen in public transport systems whereby approval of the ticket depends on external judgement. Internal validation exists when the judgement or approval is from within oneself, knowing that something is right – the right thing to do, say or be. How can internal validation be demonstrated as a leader? When self-confidence and competence actively serve and drive positive contributions to business achievement, internal validation is evident. In a leadership role, this may be observed by being clear on the vision (that is shared), perseverance towards goals, never-ending passion for the future and a consistent following from others. Self validation demonstrates inner trust, trust of oneself and the ability to ‘internally feel’ when something is right. This inner trust and confidence will be felt by others around, reinforcing the deep commitment of followers. What are the benefits of internal validation in business? When a leader is internally validated, others feel confident and wish to follow. An internally-validated leader is highly evolved in the ability to ‘feel’ and approach situations from a space of connection, and hence will also remain ‘in touch’ with the world around. The inner knowing creates the future, and can visualize things prior to concrete evidence existing. Internal validation is independent of external judgement whilst also recognizing the importance of interdependency. Can a leader be so internally validated that it may be to the detriment, or exclusion of others? A leader sets a shared direction, one that aligns and fulfills. As this is a co-dependent role, recognizing a space for both leader and follower, the internal validation must serve codependency for the leadership to ’really lead’. How can internal validation support other elements of business? Internal validation is a pre-requisite for successful leadership. As leadership is about challenge, change and new directions, strength is required to take an organization to places unknown, to know what will serve and to create the conditions that will sustain action. It facilitates decisions to be made, lessons to be learned and progress to be celebrated at times that serve best. Internal validation is as important to business as a foundation is to the construction of a house. If you would like an ‘embers’ facilitator to take you and your team through the process we have several workshop levels to choose from. Contact us for a consultation and ‘readiness’ evaluation. Skills for 21st century leadership include reflection and connection, collaboration and innovation leading us to ‘become’ and evolve beyond current barriers. However achieving that in isolation of what will serve the corporate future may be futile. The evolved sector of the corporate world’s leadership sees benefit in internal validation of leaders, as it strengthens resolve, guides business decisions according to the greater good, serves the business players and endorses conviction in a future that will serve all equally. Let us know when you see or hear of more great examples!